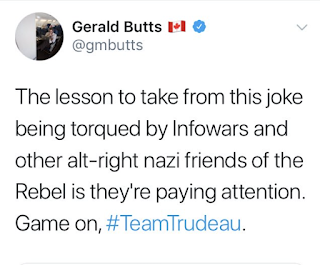 I follow Gerald Butts on Twitter but I guess I was too absorbed in fighting with Quillette to notice the controversy with Quillette's spiritual father alt-right Ezra Levant. First if you read the tweet you can see Butts' says "alt-right nazi friends of the Rebel" and doesn't call Levant a Nazi. Secondly it's absolutely true that Levant has alt-right nazi friends. I guess Levant is counting on nobody remembering Gavin McInnes' infamous rant while he was working for Rebel Media. As CanadaLand helpfully offered: We Watched Gavin McInnes’s Full Anti-Semitic Rant So You Don’t Have To. "...when it comes to civil discourse, when it comes to the back and forth that happens in this house, it's a real shame to see the conservatives using lines straight out of Rebel magazine, and Rebel web cast. The Rebel should not be writing commentary and questions for the members opposite. They should know to disassociate themselves from that kind of politics and those kind of personal attacks." Ouch! That's gotta hurt "Rebel magazine, Rebel web cast" he doesn't even call it by its actual name. Sorry Ezra Levant, he's just not that into you. 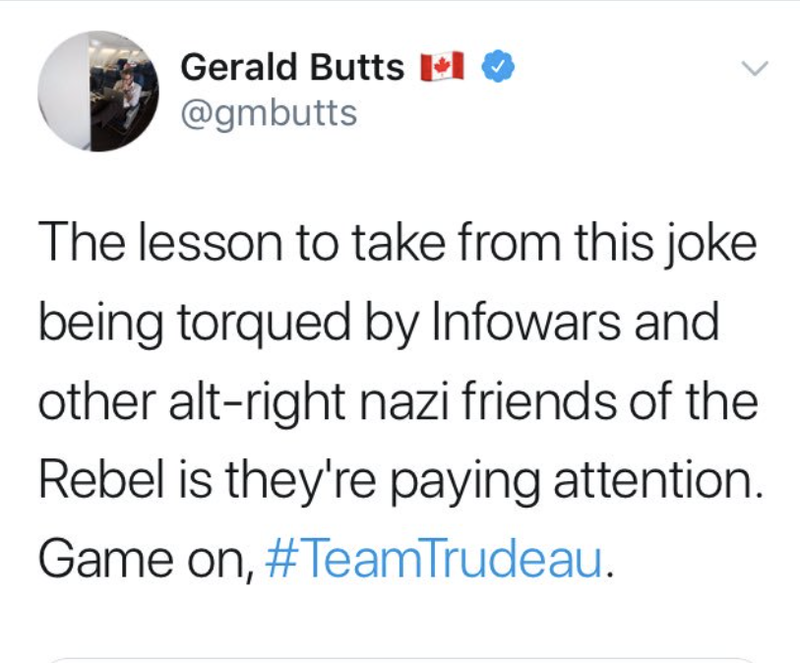 Although all of Canada must be aware at this point of the cavalcade of racists and nazis and alt-right feminist-haters like Claire Lehmann who like to hang out at Rebel Media.